Once again, things have been a bit quiet here on the blog. There are a number of contributing factors but rest assured I have been hobbying away quietly in the background. 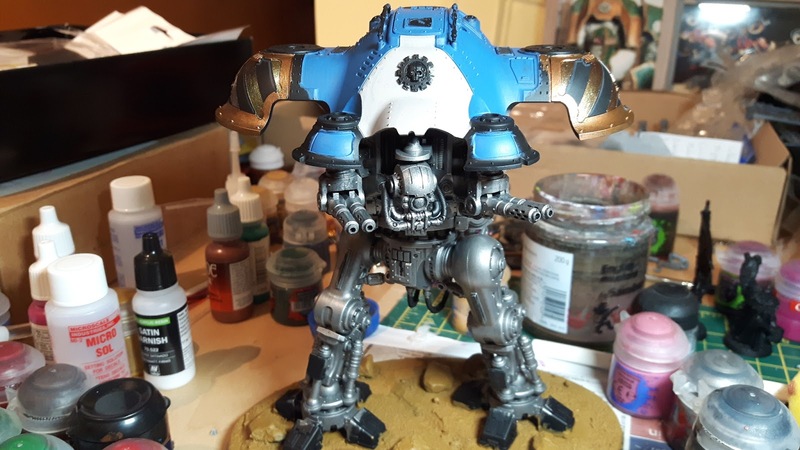 I'm working on a handful of small commissions alongside a Dominus Knight Valiant for my growing Knight household. Knight Valiant! Most of the parts aren't glued on. I was fortunate enough to receive the Knight Valiant as a Birthday gift (thanks Blazmo!) and have been excitedly working on it ever since. 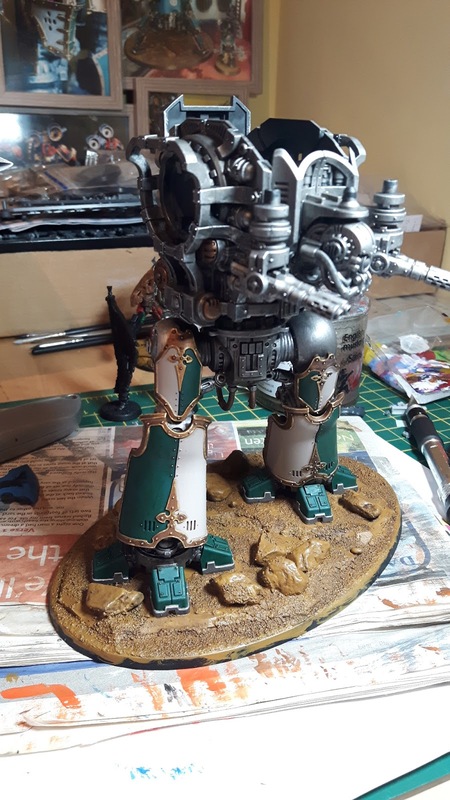 This is the first Imperial Knight kit I've had from new and it was a delight to build. The instructions are clear and luxurious and the design of the components is perfect. As is my preference when painting large models, I've built it in sub-assemblies which will be glued in place only once they are painted. Looks a bit weird without the arms. I've now made some headway with the painting. As with my previous knights I'm using a spreadsheet to track the progress and by my estimate I'm now 51% complete! Not bad if I do say so myself! I find tracking the progress of these models is essential so that I don't become disheartened and give up because it can feel like slow progress at times. As you can see I've tried my hand at a bit of blingy hazard striping on the shoulders. 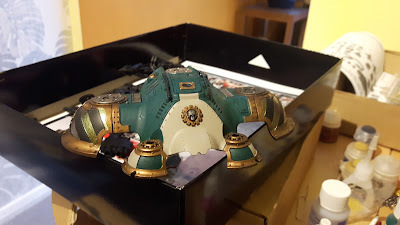 I'm not 100% happy with it, but I think it will look ok as part of the finished model. The legs are now virtually finished. Once again, following the process of my previous knights, I'm painting from the ground up. The legs are now done and I've started working on the body armour. The next big step will be the arms and weapons. I need to find time to polish off those commissions as it isn't fair to have paying customers waiting while I mess about with my own stuff. But for now, the Valiant has captured my interest. Wish me luck as I try to polish off this beast in the next couple of weeks! 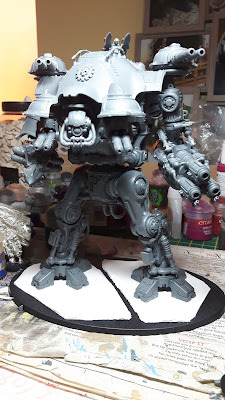 Oh, and as an aside, I did consider entering this bad boy in Dreadtober but it would have been a very challenging model to complete in the month. It's a shame, as I love the community painting events but I felt like it would be too much pressure this time around. Love the Hazard stripes, good colours on the carapace and leg greaves. Cheers Siph! I'm slowly grinding on through it. I hope the stripes work with the finished product. I also like the Hazard stripes! Great job on those. Always good to have something of interest to break up the color scheme. Thanks very much! All these compliments are making me think I should put them on the next knight too! Ah that is a shame as I have faith that you would have gotten it completed. Looks well so far. Even with tape I can never get good hazard stripes. Thanks for believing in me Rory! 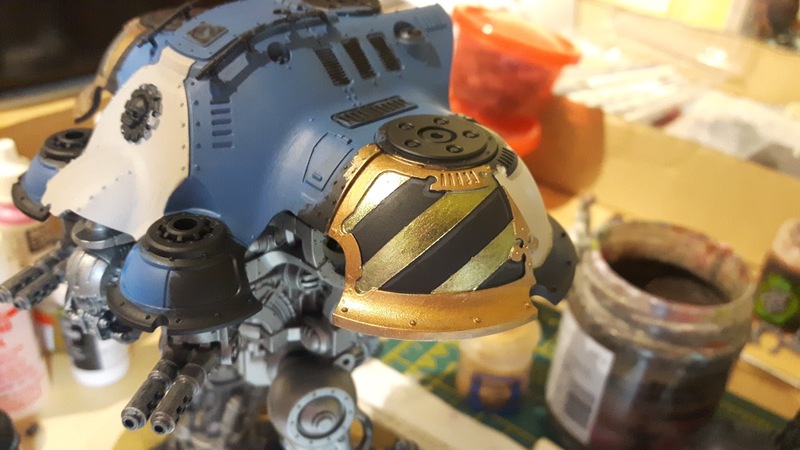 You can probably tell that I taped off the hazard stripes here. I never would have got them so straight by hand! Great stuff! You've been making great progress on this, looking forward to seeing the finished article. Cheers Mike! Not much progress yesterday but I'm hoping this evening I will get a chance to put some more work in.